It’s been four months since my last blog post on the Euro Exchange Rate when back in December 2015 I reported on the Euro Exchange Rate Over The Last Year. 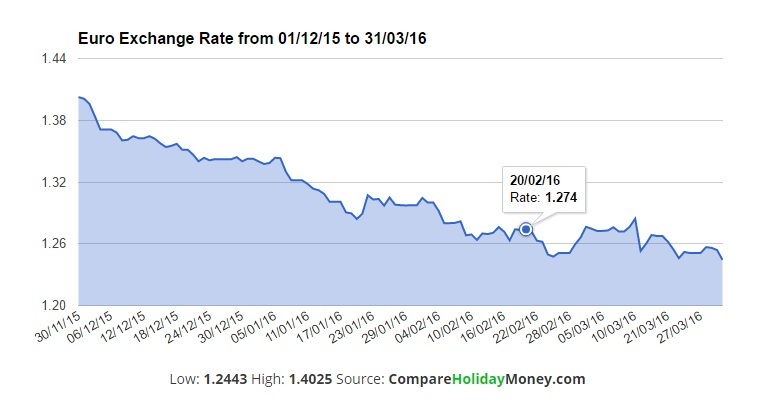 In 2015 the Euro Exchange Rate was very good for British consumers looking to take a holiday to Europe especially during the summer months last year. However, what with all the Brexit news and uncertainty over the EU Referendum this has certainly created a big impact on the Sterling Euro Exchange Rate. 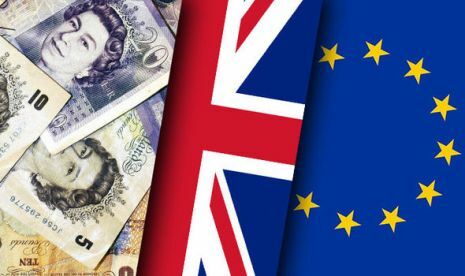 Since December 2015 and the turn of the year the Sterling Euro Exchange Rate has gradually declined over fears that the UK will vote to come out of Europe. Now if you are looking to take a holiday in Europe this year and you are looking to Buy some Euros for your holiday then timing could be everything when it comes to getting the best Sterling Euro Exchange Rate for your Travel Money requirements. Last summer in 2015 the Euro Exchange Rate hit 1.4217 which was the highest in the year and currently in the above Sterling Euro Exchange infographic from 2016 the Euro Rate has dropped down to 1.2443 which is currently the lowest it has been this year and what the Euro Rate will do between now and the 23rd June 2016 is quite difficult to predict. If you were taking £1000 then you would have received 1421.70 Euros last summer, however, now you would only get in return 1244.30 Euros which is a difference of 177.40 Euros which equates to roughly £145.00 worth of Euro Travel Money. 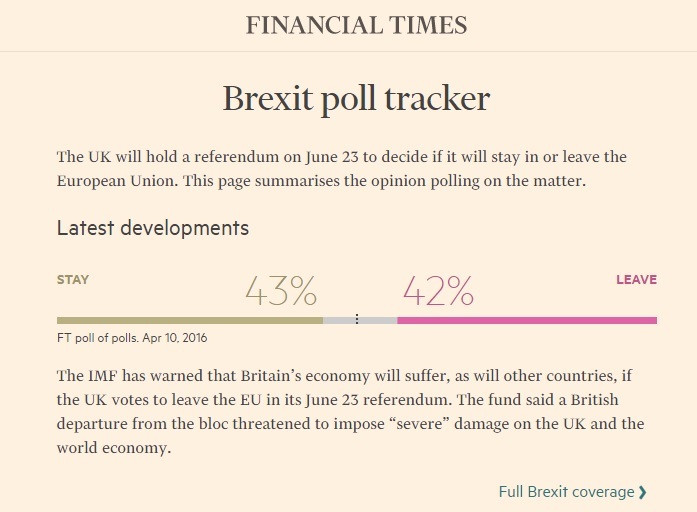 If you are interested in tracking the Brexit Polls then the Financial Times have this great web page showing the latest Brexit Poll results and the latest Brexit news. At present it shows that 43% of people are going to vote to stay in the EU versus 42% of people looking to vote to leave the EU which leaves the rest as undecided voters. However, as we get closer to the voting deadline date of the 23rd June 2016 I am wondering how many people are going to be interested in voting what with the UEFA 2016 European Football Championships starting on the 10th June 2016 and most people starting to think about their school summer holidays around this time. If you are going on holiday before the 23rd June 2016 then you might have no choice but to Buy Euros at the Sterling Euro Exchange Rate that is on offer at the time and you can compare the latest Sterling Euro Exchange Rates by using our Euro Travel Money Comparison Table in order to find the Best Euro Exchange Rate from the best Euro Currency Exchange Suppliers. However, if you are planning on going on holiday after the Brexit and EU Referendum voting deadline then you have time to wait and see if the Sterling Euro Exchange Rate improves and if you are interested in receiving the latest Euro Exchange Rate news and Brexit updates then please sign up to our Email Newsletter or join us on Facebook or Twitter. Adam manages the marketing for both Compare Holiday Money and Currency Buy Back, assisting the team in developing brand awareness and the services that each website provides. He joined the team in 2011 and is responsible for content creation, social media and building relationships with new travel industry contacts and guest travel bloggers. Airline scratch cards – what are the odds? That article was published in April 2016 I think. A lot has happened in currency since that time. We regularly post material related to Brexit as we get nearer to the start of the process we will continue to do so.